A mix of open bookshelves and closed cabinets are a great combination for any home office. This one displays attractive leather bound books and heavily used reference materials on the upper suspended bookshelves, offering a distinguished, traditional aesthetic that blends with the rest of the house. Less attractive but necessary items are filed and/or kept out of sight in the lower cabinets. This allows for the ability to keep important paperwork and office supplies neat, organized, and within reach. Unsightly cords are hidden with our wire management covers. Eye strain is avoided through the use of LED puck lights that are recessed beneath the upper shelving, providing good task lighting. The long, built-in desk accommodates two people, but each has a separate work area and adequate storage so that no one feels cramped, essential to a positive work-from-home experience. 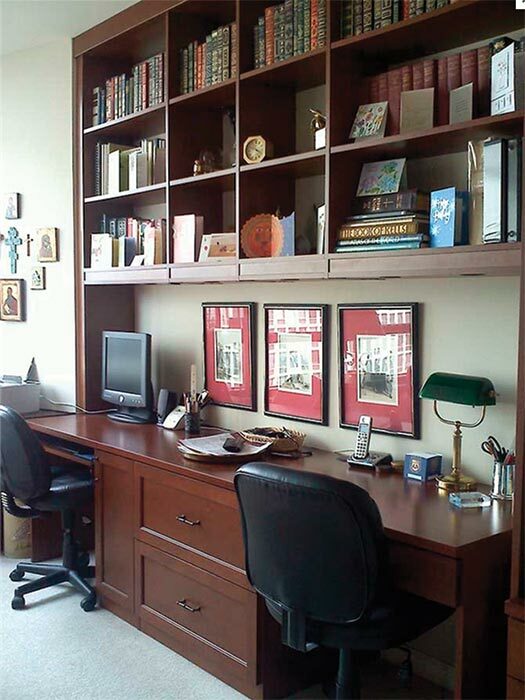 Custom home office organized with multiple desks and home office storage cabinets for a work-at-home couple.